This website was created to accurately portray and preserve the World War II history of the 104th Infantry Division, to recognize the contribution of the 34,000 men who proudly wore the Timberwolf shoulder insignia and to honor the memory of those gallant men who perished in battle. The former soldiers of the 104th Infantry Division, bound together by common memories and experiences, formed the National Timberwolf Association on October 19, 1945. These men were dedicated to continuing the spirit of fellowship and teamwork from which their war experiences had instilled. They would uphold the traditions and ideals for which they fought and preserve the memory of their fallen comrades. After 65 years of gathering at the national reunions, the final Timberwolf reunion was held in September, 2010 and the difficult decision to end the National Timberwolf Association was made. On March 1, 2013 the formal organization of the National Timberwolf Association ended and although the formal structure no longer exist, the legacy and traditions of the Timberwolves will endure. The National Timberwolf Pups Association was officially formed by the descendants of the Timberwolves, and is dedicated to continuing the traditions set forth by their fathers and maintaining the legacy of the 104th Infantry Timberwolf Division. Sixty-eight years after the original publication of this history, the National Timberwolf Pups Association is pleased to announce that a 2014 edition of TIMBERWOLF TRACKS is now available. 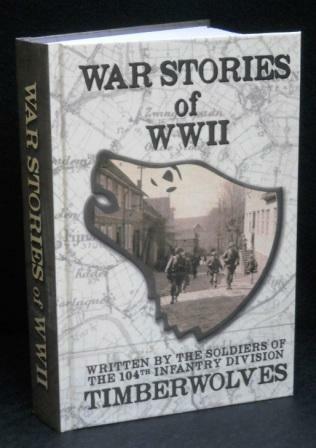 Since the first printing of TIMBERWOLF TRACKS in 1946 there have been subsequent editions printed which included and updated the history of the National Timberwolf Association. With a new addendum, the 2014 edition brings to close the NTA and the beginning of the National Timberwolf Pups Association . We appreciate your comments about this site. If you discover problems, please advise the Webmaster.